While Tune Sweeper does most of these, it is a real laggard. 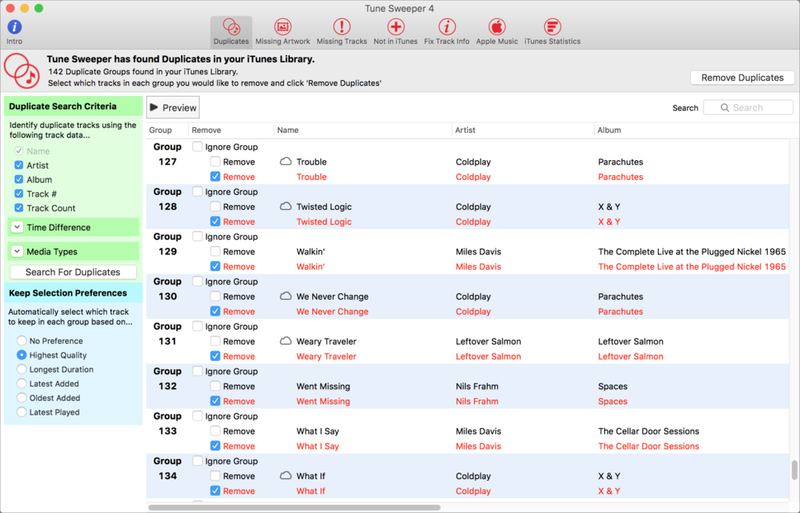 At launch, Tune Sweeper reads the iTunes Library.xml file, which is accessible to third-party apps. With my library of about 65,000 tracks, on a fast Retina iMac, it takes about 3 minutes and 45 seconds to read this file and display the main interface. Tune Sweeper’s main interface gives you one-click access to its many features. This performance issue recurs when testing all of the app’s features. For example, when scanning for duplicates, it took 27 minutes for Tune Sweeper to give me a report. Compare that to Doug Adam’s $15 Dupin, which takes about 7 seconds to display a similar report. Tune Sweeper’s interface for culling duplicates is a bit confusing, and makes the process of culling duplicate tracks arduous. Tune Sweeper’s Duplicates feature returns a long report, which requires a lot of work to navigate. The Fix Track Info feature is questionable. There’s no way to know what needs to be fixed until you download the information. And then, in some cases, I only see a ? next to a track. This suggests that Tune Sweeper flagged these tracks as having incorrect tags, but was then unable to figure out what was wrong. It said that my library had more than 10,000 tracks with incorrect information. After I downloaded all the track information, most tracks came back with ?. The Not in iTunes feature scans your drive for music files that aren’t in your iTunes library. I bailed on this after about an hour. It presumably scans the entire drive, rather than just the iTunes Media folder. 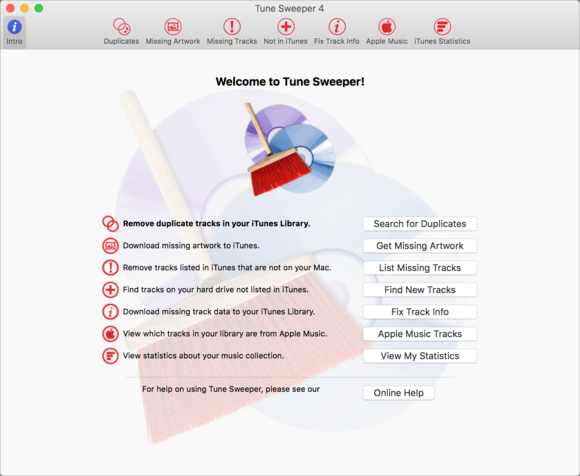 Since I have music in other folders—a second iTunes library, and some archived music files—Tune Sweeper was looking at everything, instead of just the files that somehow got deleted from my library. On my MacBook, with a smaller library, it did find a few dozen such tracks. And the Missing Artwork feature displays a lot of tracks with artwork, and, when I tried downloading artwork, did nothing. Tune Sweeper does find all Apple Music tracks, and its statistics give an interesting look at the type of music in your iTunes library, and what you listen to most. 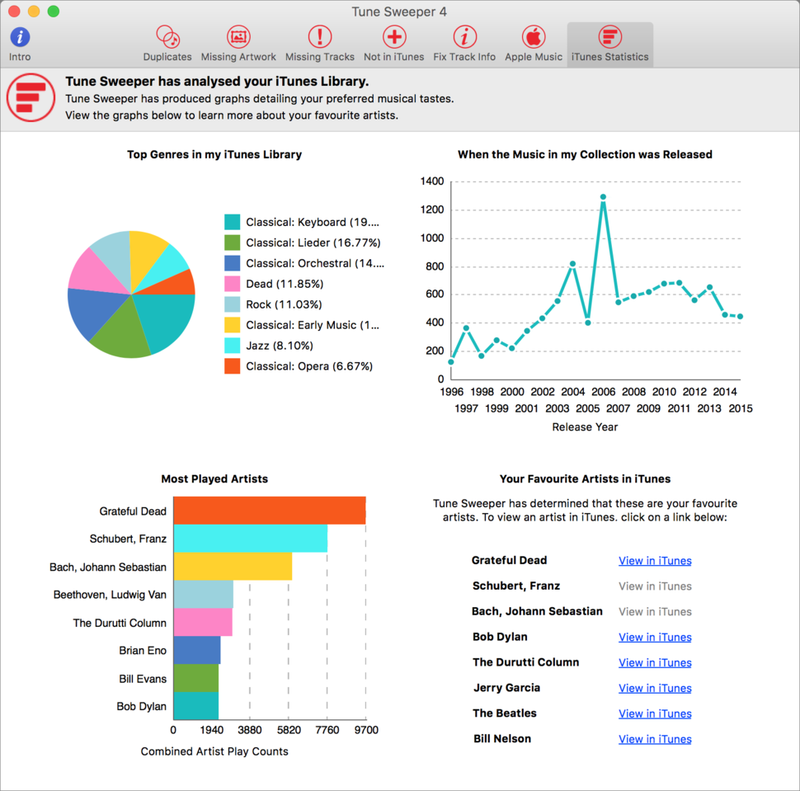 Statistics give you an overview of what’s in your iTunes library, and what music you listen to most. Tune Sweeper needs better support of multi-core processors (it only uses about 107 percent of my CPU, or 1/8 of what’s available on my iMac). This would improve the performance issue a great deal. It also needs some clarification about exactly what it’s doing when searching for missing or incorrect tags. As a comparison, Song Genie, which I reviewed a few years ago, gives very clear information about what it suggests replacing. 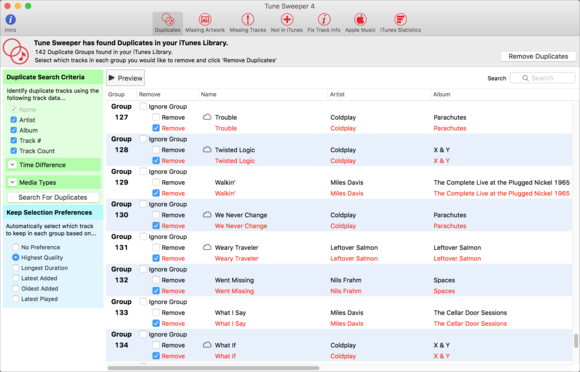 If you have a small iTunes library, then Tune Sweeper performs fairly well—I also tested it on a 10,000-track library—but the target audience for this type of app is generally music collectors with a large library who need to do a full spring cleaning. Tune Sweeper contains a number of useful features, but poor performance and confusing interfaces make it more trouble than it’s worth.